Goddess Guidance Oracle Cards - Doreen Virtue, Ph.D.
Other apps by Oceanhouse Media Inc.
Healing with the Angels Oracle Cards - Doreen Virtue, Ph.D.
Life Purpose Oracle Cards - Doreen Virtue, Ph.D.
Earth Magic Oracle Cards - Steven D. Farmer, Ph.D.
Mary, Queen of Angels Oracle Cards - Doreen Virtue, Ph.D.
Ascended Masters Oracle Cards - Doreen Virtue, Ph.D. 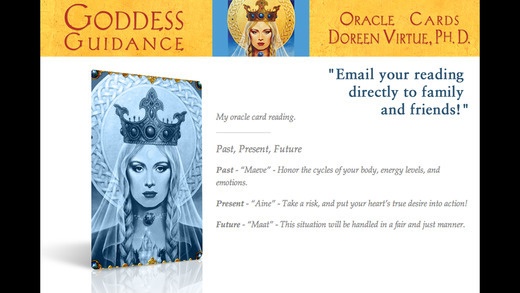 Messages from your Angels Oracle Cards - Doreen Virtue, Ph.D.
Archangel Oracle Cards - Doreen Virtue, Ph.D.
Angel Therapy Oracle Cards - Doreen Virtue, Ph.D. The Romance Angels Oracle Cards - Doreen Virtue, Ph.D.